Oceandome is an independent village-state on the east side of the landmass known as Furvilla, sharing western maritime boundaries with Dragonsmaw Manor and Olde Foxbury, and an unidentified village to the north. Its borders are said to be wherever the water touches on the eastern side of its neighboring village-states, and as a result its borders fluctuate according to the tide. Its territory is approximately 125 km across, with the dome approximately 35 km in diameter. With an area around 15,500 square km, it is one of the least densely populated village-states in Furvilla, with about 32,000 (2017 census) residents. As the only village-state that is completely underwater, its economy and diversity make it an attractive location for scientists and researchers. Oceandome is a diverse society consisting primarily of sea mammals and fish, though a small minority of the population are terrestrial creatures sporting diver uniforms that seek to enjoy the mysteries and eccentricities of this town. While English is the official language of Oceandome, much of the population is multilingual and use high-pitched underwater language called Whistle, which are frequency-modulated whistles made by vibrating connective tissue underwater. The village-state is known for its annual Treasure Hunt celebration, its extensive reefs, many tiny tropical islands in its eastern waters, and its unique species: the Manokit. “Oceandome” comes from the structure of the dome under the shoreline, though the village-state’s name was only changed when the dome was erected. Originally, the 125 km territory was known as Aqualis, and was an entirely underwater village consisting only of marine life. Records of Aqualis date back as early as 1565, when early aquatic colonists migrated to the western shoreline and the dense reef that offered them safety from the open ocean. As alliances and trade with the neighboring village-states of Olde Foxbury and Dragonsmaw Manor started to grow, there became a demand for terrestrial creatures to walk among the ocean dwellers. In 1812, the Oceandome Project was commissioned with the financial aid of Olde Foxbury. It took a hundred years for the dome to be built, but in 1912 the dome was complete and drained of all water. The dry land inside the dome is a small portion of the village-state’s territory (with the dome occupying about 1,300 square km out of the entire territory’s 15,500 square km) but it is still the village-state’s most noticeable architecture. As a result, Aqualis was renamed Oceandome by its inhabitants. Oceandome has been a democratic village-state for the entirety of its existence. Its mayors function as sole leaders and are voted into office by the populace every five years. Oceandome’s current mayor, Octavia, has been voted in numerous times due to the residency being pleased with her leadership. Oceandome has always taken a passive approach to foreign politics and generally will not involve itself in the disputes of other villages. As a civilization located completely under the water, it has the benefit of the ocean’s protection from invasion or any attempt to control its land or resources. Foreign invaders typically cannot attack Oceandome due to being unable to breathe underwater. Of course, the dome has circulated air moving through it that terrestrial creatures can breathe in, but with the dome taking up a tiny portion of the actual village’s space, the vast majority of the village is located outside of the dome (and is generally only occupied by terrestrial villagers and tourists). Olde Foxbury has always been the village-state’s closest ally, and though Oceandome is loathe to engage itself in any combat, has a war-pact with the other to offer rations and supplies to its ally if war were ever to break out. Oceandome has never promised the aid of any of its standing army to its ally, primarily because its army is aquatic and would have great trouble fighting in terrestrial territories. Relations with the other village-states have varied throughout the years. Though Oceandome has had its primary conflicts with Dragonsmaw Manor, in modern times the two village-states have come to a truce and engage in each other’s economy peacefully for trade. Quetzal Palace, despite its reputation for violence and intimidation, has never tried threatening Oceandome due to its army’s inability to fight underwater. Tigereye Peak does not engage much with Oceandome aside from the trade routes that go through Olde Foxbury. With an army of about 3,300 standing warriors, Oceandome has one of the smallest armies available. However, their location makes them near impossible to attack, so Oceandome has never felt much of a purpose to building up its army. Instead, its army is primarily used to combat the various monsters that lurk on the outside of Oceandome’s territory. The village-state is frequently attacked by sea monsters and other denizens of the deep, making its standing army vitally important to the functioning of its economy. 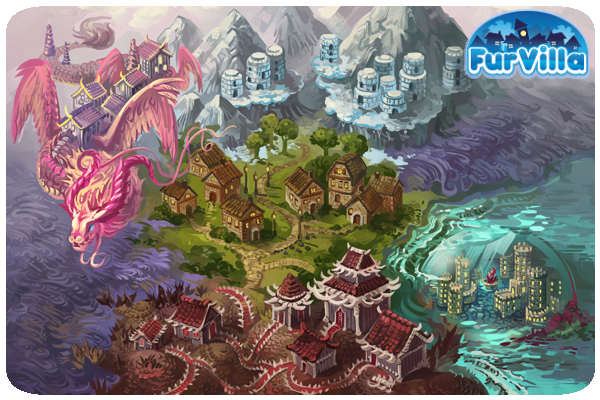 The majority of Oceandome is situated throughout the Great Furvilla Reef, which stretches all along the eastern border of the landmass Furvilla. While the dome itself is situated on a section of the ocean floor that does not have a lot of reef, still, a sizeable amount of reef had to be relocated for the construction of the dome. The majority of inhabitants’ houses exist among the reef itself, or built inside of it. Homes are typically built from reef and coral, or combinations of reef, coral, and stone, where the most frequently used material is called ‘Coral Wood,’ harvested from the massive forests of coral dispersed throughout the territory that can grow up to twenty feet in diameter. To the eastern side of the dome, beyond the glass, is the underwater downtown area, where the mayor’s headquarters and many of the stores and shops are located. Many of the village-state’s homes are clustered around this area, but also radiate to the north and south of the dome itself. Very rarely can any houses be found to the west of the dome due to earthquakes. The Great Furvilla Reef is a barrier reef straddling the shoreline east of the Furvilla landmass. It is a popular tourist destination, with tourists visiting the Oceandome to take in the breathtaking sights of the reef and the aquatic life around it. It is also a popular site for scuba diving and snorkeling. The tropical sandy beaches bordering Olde Foxbury are said to be some of the most beautiful, though the further south one gets into Dragonsmaw Manor territory, the beaches are rockier and less appealing. Oceandome’s territory sports over sixty species of hard coral, including the massive Wood species, forty soft coral species, over a thousand species of fish, and hundreds of invertebrate species. Though research continues, there are some estimates that only 20% of the reef has been explored, and that many more species of fish and invertebrates still remain to be discovered. While in the past, conservation wasn’t a high priority for Oceandome or its residents, the tourist economy has led to a rise in conservation activists. While the Coral Wood is still often used for home construction, many villagers have taken to protesting its logging, citing that it’s the only location known to Furvilla where the Coral Wood grows. Referendums seeking to expand the size of the Oceandome footprint are often defeated out of concerns for the reef. It is notable that a vast majority of the reef relocated during the original construction ended up dying, with only about 10% settling in its relocated site. The waters of Oceandome are known for being tropical and warm, and very rarely drop below seventy-five degrees. For the most part, living in Oceandome is a peaceful existence, though there is a fault line running along the shoreline between Furvilla and the ocean that has given scientists cause for concern. Sometimes Oceandome will suffer light underwater earthquakes, but they are far enough from the dome itself that they have not caused any damage, and residents know not to build west of the dome. Inside the dome itself, the temperature is generally set to seventy degrees. Because Oceandome is in tropical waters, it does not experience seasons. Mild fluctuations of water temperature sometimes occur but do not reach outside the range of 75 degrees - 80 degrees. Oceandome’s stable climate and tropical waters are a reason why many choose to live there. Oceandome’s main export is the morphing potion of its unique species, the Manokit. It also enjoys exports of some weapons and armor and underwater plants, though the majority of its income comes from tourism. Many villagers have tourism businesses that take tourists to sections of the reef, guide them around the dome itself, or introduce them to some of the region’s tropical islands and beaches. The village-state has four commercial banks, with the oldest of which being the Aqualis Bank, a corporation known for the prior name that Oceandome once operated under. Many credit unions also exist in the village-state, giving its citizens access to capital for their ventures. The majority of loan applications involve weapons development, tourism, and underwater plant harvesting. Underwater plant harvesting is a robust industry, though one that has lately been coming under fire by conservation activists. Scientific research indicates that nearly 20% of the reef’s underwater plants and animals have gone extinct in the time since Oceandome was built, which, conservationists say, is a devastating amount of underwater life loss. Most notably, the plant Servillas aquatis became extinct in 1996, which was over-harvested due to its inclusion in an alchemy potion that increased the probability of twins in animals bred in captivity. Oceandome residents have always prided themselves in providing quality education for their children. Children are often apprenticed to a master to learn a trade, which is often the trade of a warrior, blacksmith, doctor, or alchemist. All Oceandome children are expected to attend school from age five to fifteen, in a ten year compulsory education requirement. There, they are taught about the reef around them and the history of Oceandome, as well as skills in mathematics, reading, and science. Artistic endeavors are highly encouraged in Oceandome, with many schools encouraging students to create sculptures made from coral. Underwater dyes have also been used throughout the years to cultivate an interest in painting. Sculpture is certainly Oceandome’s greatest love, as well as music that is made in the village-state’s unofficial language of Whistle. It is not uncommon to hear a town begin a song in Whistle around early evening, as these traditions are meant to draw families together for the night and discourage overworking. The cuisine of Oceandome primarily involves seaweed. Most diets are composed of 80% seaweed and 20% protein based from fishing. Oceandome residents are known for their aversion to cooking - of course, fires cannot be lit under the water, so Oceandome residents eat their meals raw. A common meal involves wrapping a piece of fish in seaweed. 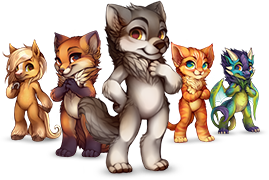 The highly specialized diet has resulted in Oceandome residents being among the longest living villagers in all of Furvilla. Swimming is more than just a way of life, it is a sport. Villagers often hold races to determine who is the quickest swimmer. Four times a year, the One Mile Race is held, where contestants swim a mile to determine who is both fastest and capable of endurance. Other sports include balloon ball, a sport that involves hitting a ball down while the ball moves toward the surface due to being filled by air. The team that has the ball surface in their space is the one that loses. The national flower is the Neural Plant. The national animal is the Rainbow Ray.